It seems that no matter how many conferences you attend, all over the world, they all seem to have the same old boring swag. Which makes sense, right? Who doesn’t need yet another flimsy notebook with a pen that won’t survive the event (if it even worked in the first place)? Or how about adding to your collection of ill-fitting, scratchy t-shirts that you’ll inevitably use to wash your car next week? 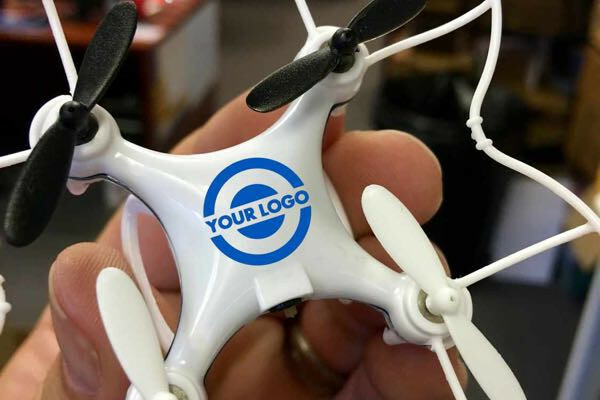 Swag is not only a great way to get your brand into the hands of current and potential partners and customers, but it’s also a great way to remind event attendees who you are as a company, long after the event has ended. What you say with your swag reflects on your brand, so be sure you’re spending your giveaway budget the right way. If you’re not sure where to begin when it comes to swag, have no fear. We’ve compiled a list of our current top 10 favourite swag items to help inspire your next event. Whether it’s a useful little knick knack or a high-value tech toy, there are great options out there to cover any brand personality. It’s little, but boy is it effective. This little silicone tchotchke can change lives—we speak from experience. This is the best cord management tool we’ve come across that allows you to effortlessly pull your headphones out of your bag—hurried, awkward unwinding time not required. We know what you’re thinking. Really? A USB? Yes, really. Everyone needs storage, so no matter how they look, USB sticks will always be useful. But this one stands apart from the rest because it’s memorable.This isn’t your average throw-away goodie. This is a well-designed, creative, custom-made piece of storage that folks will keep around just for the novelty of it! Just make sure that you get one that’s usable (read: at least 8GB) so it can actually add value. For the fun-loving kid (or adult) in all of us, we can’t think of a cooler gadget to walk away from an event with than your very own flying machine. Yes, it’s a high-ticket item, but it’s perfect for a tech-obsessed crowd. Be mindful of travel regulations for your out-of-town guests as some airlines have restrictions around bringing drones on planes. Do you know how much water you drank today? Us either. Although we live in a world obsessed with the intersection of technology and wellness, it’s not always focused enough on self-care. Enter the Hidrate Spark water bottle. This gorgeous gadget lets you set hydration targets for yourself in an app, and will light up throughout the day to remind you to keep on drinking that H20. We’ll drink to that! Perfect for a high-energy event, this novelty item isn’t one that your attendees will expect. This action camera is perfect for capturing anything from sports, to travel, to entertainment, and beyond. The camera shoots n high definition video, which will likely make it impossible for your guests to resist using it right then and there! Don’t forget to give them everything they need—create a ready-to-go package by also including the storage cards. You know that moment of perfection when your coffee or tea is just the right temperature? Everyone has their perfect setting, but rarely is it ever achieved. Thankfully, there’s this mug, which lets you control the precise temperature for your hot beverage with just a few taps on a mobile app. You’ll never have another lukewarm sip of coffee again with this gadget in hand! A great swag item doesn’t have to be just one thing. Be creative and think through your organizational strategy—is there any kind of package or bundle you can create that sends a message aligned with your brand? As an event marketing agency, with the help of the team at Brand Blvd. we created a branded “Event Emergency Kit” with a selection of items that come in handy for folks on the go including hand sanitizer, stain remover, tissues and more. It was a huge hit with guests! Chances are, some of your guests will have traveled to your event—and even if they didn’t, they’re bound to eventually. Make them feel right at home with a comfy, cozy travel item. Whether it’s slippers, a travel blanket, an eye mask, or inflatable pillow, creature comforts can go a long way in elevating the travel experience! But hear this: make sure that you select only high-quality items that can stand the test of time and ensure that your guests have the best possible experience with your brand! Wires are so 2012. Keep your guests in-the-moment with a pair of Bluetooth headphones. Even the pickiest of guests will find this to be a useful addition to their desk, coffee table, car or kitchen counter. Everyone appreciates good food! Do some research and find local vendors in your event city—you’ll be surprised to discover how many fun, creative suppliers are just waiting to feed your crowd. They’ll bring local flavor and a memorable spice to your brand, not to mention bring your swag to life in fun and delicious ways! Take a peek at these adorable fortune cookies from The Fortune Cookie Factory in Oakland, California. From fun flavours to different colours of frosting and sugar, we had tons of options to customize the perfect treat—even down to the fortune inside! We predict a memorable event! No matter what you decide to give away at your event, if you’re being thoughtful about your guests and your brand, you’ll not only be making your guests’ lives a little easier, you’ll be promoting your brand in a positive, memorable way, too! If you’d like to learn more about how LOMA Marketing Agency can help you plan your next event, contact us here or, if you’re more of a phone person, give us a call toll-free 1-877-322-4130 and ask for Loren. © 2016 Loma Marketing Agency Inc. All rights reserved.